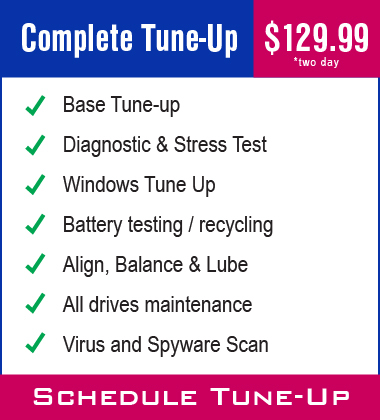 Just like your car, your Eurocom laptop gets benefits from having regular tune-ups and maintenance. Keeping your laptop clean and running at 100% efficiency gives you better performance and most importantly extends the life of your notebook. The enemy of every computer is heat. The hotter your unit runs the slower it performs and eventually the shorter your notebook will last. Having your laptop tuned up keeps the fans running efficiently allowing better air flow into your CPU and Video Card. As laptops pull air through the fans cooling these parts, dust and dirt and debris also get pulled into your laptop computer eventually causing the fans to run less efficiently and also coating your heatsink with dirt. After a while air flow is restricted and the fans have to come on earlier or run faster to keep your unit running. Eventually, if your unit is never cleaned out, air flow becomes so restricted that overheating occurs, causing permanent damage to your laptop. 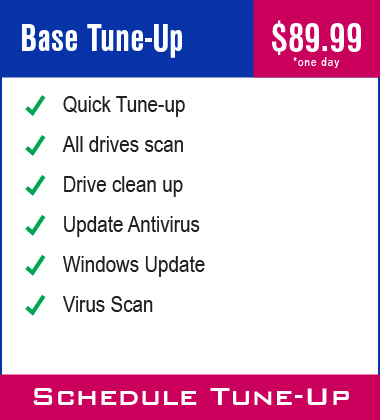 This can all be prevented by having one of our techs here at Eurocom give your laptop a Tune Up on a regular basis. After any tune up your Eurocom technician will also take you through any upgrades that may be available for your unit. By using our upgrade service you can greatly extend the life of your laptop. 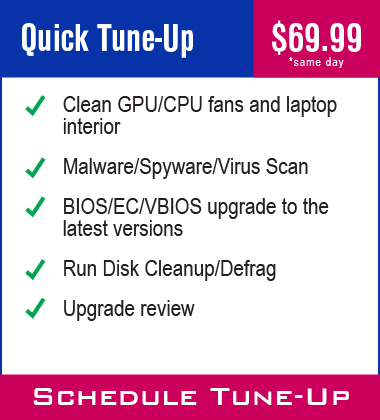 Even if your laptop is not a Eurocom, drop by and choose from one of our 3 tune-up packages.